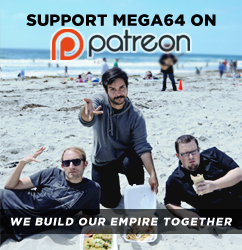 THE MEGA64 PODCAST 314 IS LIKE A SLICE OF "PI" LOL!!!!! We're off to the SD Comic Con! One final time- remember that we're at Booth 1453 with all our merch and exclusive stuff. The whole crew will be there and we're down to chat and sign whatever you got. And Friday night at 8PM in room 6DE is our big panel! We promise you will be very happy you attended! See you this weekend!